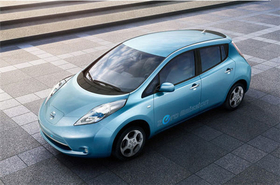 The zero-emission Leaf will cost less than 30,000 euros after subsidies in Europe. TOKYO (Reuters) -- Nissan Motor Co. said on Monday it had received 6,000 orders for its Leaf electric car in Japan, meeting its sales target for this business year before the model is due to hit the market in December. Of the pre-sale orders, about 60 percent are from corporate customers, a Nissan spokesman said. Japan's third-biggest automaker had already received orders for 13,000 Leafs in Japan and the United States as of a month ago, surpassing its output capacity of 10,000 units for the business year ending in March 2011. Nissan began taking orders from retail customers in Japan on April 1, and from April 20 in North America. About 60 percent of the retail customers placing orders in Japan were over 50 years old, the company said in a statement. Leaf orders start in four European markets next month. The car will make its European showroom debut in December in the Netherlands and Portugal while the UK and Ireland follow in February 2011. The five-seat, zero-emission hatchback will cost Japanese consumers 2.99 million yen ($32,530) after government subsidies. The price after subsidies in Europe is less than 30,000 euros (about $35,860). Nissan and its French alliance partner, Renault SA, plan to have total production capacity of 500,000 battery-powered electric cars by 2012. The partners so far have invested more than 4 billion euros in electric vehicles.